Where I put stuff when I can`t think of anywhere else to put it, though, to be frank, there`s some pretty useful (and interesting) stuff on here, even though I say so myself….. In the UK television transmissions are usually referred to by a channel number (not to be confused with programme channel, e.g. BBC1) as opposed to a frequency. Both the channel number and the frequency are given on all our Channel Allocation Guides (e.g. 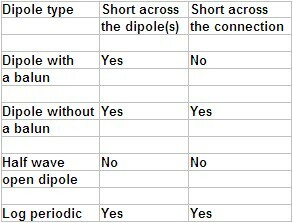 the one for Crystal Palace) , plus the table below also shows channel number v frequency (and also the wavelengths). Where Fc = Centre frequency of the MUX, and n = Channel Number. Where Fv = Frequency of the vision carrier in MHz and n = Channel Number. Note analogue does still exist for modulated RF signal distribution ! lower than the analogue (although it`s actually 306 - 303.25 = 2.75MHz). Since most tuners use channel numbers this 3MHz difference is not usually significant, but if you are trying to enter the actual frequency to yours it obviously might be for you ! Some digital MUXES are transmitted with a channel offset and these are + or - 0.167 MHz. The vast majority of digital TVs or STBs can still tune in to a MUX even if it has an offset and this is generally also the case in manual tuning. But if you have trouble trying to tune in your MUXES its always worth checking that the tuner is not being sidelined by an offset, though this should be rare. 2 Hold the bracket on the corner of the chimney and pass the lash wire (which is attached to the Eye bolt) round the chimney. Straighten the wire out and slightly "curve" it, then pass the wire over the top of the chimney, or around it, if necessary by throwing the end round and catching it. Ensure the lash wire is horizontal all the way round the chimney. 3 Loop the free end of the wire round the J bolt and pull as tight as possible, then wrap the wire round the J bolt twice. Finally wrap the wire about six times tightly back round the lash wire itself. Now [and only now....] cut off the lash wire. Is actually stronger than using one larger bracket. Also note that the bottom bracket is galvanised and the top one only painted. Gravity plus height is a bad combination, don`t fall off the roof. If in any doubt about this scientific fact, don`t do the job. This is not meant to be an exhaustive article on the use of ladders, it`s just a reminder of the most important things to remember when using one. Surface : The ground on which the ladder is to be rested should be firm, and not slippery. Level the ladder : Use of a ladder leveller is the best idea, but not everyone has one of those. Never use wooden wedges or a stone. Place a large piece of plywood (neither painted nor wet) under the ladder leg with the gap under it. Chock the board so it levels the ladder but, just as importantly, it`s stable and isn`t going to go anywhere. Angle of the ladder : This should be about 70 degrees from the horizontal, a more practical check is the 4 up 1 out rule, e.g. if the top of the ladder is 8m from the ground, the base should be 2m out from the wall. Some ladders have a "ladder line" at the correct angle marked on the side. Mitre chimney bracket installed round a chimney. This isn`t one of ours, you can tell that because of the rust staining on it, which there wouldn`t be on one we sold, not for 20 or 30 years anyway ! the pole at this point. If it`s a cranked pole ensure the aerial is pointing in approximately the right direction relative to the crank and the transmitter. 1 & 2 [as an alternative] In order to temporarily loop the lash around the chimney (before adding the bracket) pass the wire round the stack then lightly bend the free end of the lash wire so it can pass through the Eye bolt. With the lash wire already looped around the stack now place the chimney bracket on the corner of the chimney, install the eye bolt and the J bolt in the relevant holes on the bracket then attach the wire to the J bolt as described above (at 3 above). Do not install a chimney bracket on the top two or three courses of bricks. 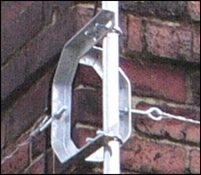 Never fit a wall bracket on a chimney, unless it`s a big stack and a small aerial on a short pole. If the chimney is ever used, or likely to be used, install the aerial on the upwind (prevailing winds are usually from the S or SW) side of the stack preferably with a cranked pole. If possible fit an end mounting aerial (e.g. a Log36) on correct side of the stack to "see" the transmitter using a short pole so the antenna is below the chimney pot. This is to avoid smoke damage to the aerial. 4 At this point, with the lash loosely assembled round the stack, bend out the lugs on the corner pieces, then push them under the lash wire and into place on the other three corners of the stack. 5 Now tighten the bolts sufficiently to firmly secure the bracket against the corner of the chimney. Note. Some "experts" say just wrapping the lash round the J bolt is sub standard and it should be 'spliced' to prevent slippage, some even recommend “rope grips”. Well I`m telling you, and them, that the above lash would never slip, absolutely no chance whatsoever. I`ve seen lashes only wrapped once round the J bolt which haven`t slipped in 20 years. Personally I would never recommend a single wrap, but it just proves a double wrap is 100% slip proof. 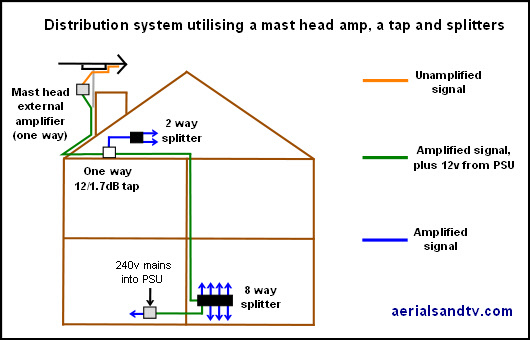 For the above system we would recommend our variable gain mast head amp, in order to obtain the correct signal level. Ideally a meter should be used, and not a £30 job, even the (not entirely believable) signal levels on STBs/TVs are better than those. But at the end of the day what actually counts is how often the picture/sound breaks up, and the best signal level can usually be obtained by trial and error with the variable gain setting. Utilising a 12/1.7 dB tap, and allowing a 2dB cable loss from the tap to the 8 way splitter, would give the following readings throughout the system (all relative to those at the input to the tap). If the mast head amp were at maximum gain, then then add 22dB to all the above readings to get the figures relative to the signal at the aerial. For the above system we would recommend our variable gain power amp, in order to obtain the correct signal level. Ideally a meter should be used, and not a £30 job, even the (not entirely believable) signal levels on STBs/TVs are better than those. But at the end of the day what actually counts is how often the picture/sound breaks up, and the best signal level can often be obtained by trial and error with the variable gain setting(s). A 3dB difference in final outputs would not usually be significant. It will be noted that there is a 15dB attenuator before the last set of splitters (to equalise the output levels, thus it would be possible, if required, to add more splitters and therefore extra outputs. If the power amp were at maximum gain, then add 35dB to all the above readings to get the figures relative to the signal at the aerial. The best way to tie off a ladder is with one of those small ratchet straps used for securing luggage or similar, but if you haven`t got one of those anything which is reasonably strong (and capable of getting a fair bit of tension on the tie off) is better than nothing. If there isn`t anything convenient to tie off to then screw an eye screw / eyebolt into the wall. It`ll only leave a small hole when you remove it and you may, at some time in the future, want to use it again anyway. Loop the strap round a rung about half way up, then angle it downwards about 45 degrees because you don`t want to just drag the bottom of the ladder in towards the wall. Do not put too much force on the strap because that`ll just damage the ladder. All you want to do is take up any play in the ladder and ensure it doesn`t move. If using a ladder in conjunction with a roof ladder always lash the two together at the point they meet at the edge of the roof. Apart from ensuring the ladder doesn`t fall (and leave you embarrassingly stranded up on the roof ! ) if you do fall down the roof you have at least got something to grab onto [i.e. the top of the ladder] which isn`t going to move. Don`t over reach : Saying don`t reach out to the side when using a ladder is obvious, but also pretty stupid, because for most jobs you have to. The thing is don`t reach out too far, particularly if the ladder isn`t tied off, which is another reason for tying it off in the first place. Top of the ladder : This should be above the top of the wall, by a couple or three feet, this gives you something to hold onto as you climb onto the roof (or whatever), and also something to grab onto if you fall off the roof, so long as it`s tied off, obviously. To be honest it`s very rare for aerial installers to ever fall off the roof, though it`s not unknown. Just so long as you`re careful it`s pretty safe fitting the odd aerial. I am not expert in electrical or building regulations, but the last I heard the definition of "a system", under which additional safety regulations are applicable, is one which supplies points to rooms behind more than one lockable door. That is to say if all points are behind one lockable door it is classed as domestic, for which no regulations apply for TV distribution systems for earth bonding requirements, as far as I`m aware. The most important requirement for system work is that it must be electrically bonded to the building`s main earth terminal (see linked pdf). All our splitters (except the CoAx one), taps and mains amps (except the 2 way amp) have earth bonding terminals and these should be used to connect onto said earth terminal. The connection can be made anywhere on the system, or at more than one point. Incidentally, use of copper/copper satellite cable (as opposed to RG6 type) is preferable for earth bonded systems because, in a fault situation (admittedly a highly unlikely occurence.....) it`s capable of carrying greater current down to earth and blowing the mains supply safety device [either a fuse or a circuit breaker]. 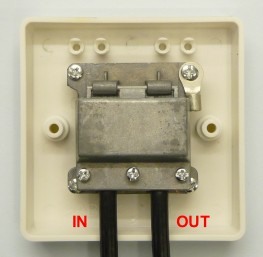 It should be emphasised that earth bonding isn`t so much about the possibility of mains currents finding their way onto the CoAx sockets as it is about preventing the “touch current” (from multiple linked double insulated - i.e. unearthed - electrical products) getting to the point where it`s detectable, or uncomfortable, or even dangerous. The latter is possible but, it must be said, relatively unlikely, though it should be remembered that different people have different sensitivity to electrical currents. Some people who are more sensitive will feel a relatively minor amount of electrical current pass through them and think they`ve had a mains shock ! Those considering installing a system (under the definition of a system above) are advised to read the appropriate electrical code of practice. As a bit of controversial food for thought. I have to say that speaking as a TV engineer (or more accurately an ex TV engineer) I cannot actually imagine how a TV, or an aerial amp come to that, could put dangerous voltages out of the aerial socket(s). In fact in August 2011 I phoned round 7 of our best (ex) customers [we supplied TV service manuals up to July 2010] and none of them had ever seen such a fault condition. The only possible method would be some ignoramus who knows nothing about TVs trying to mend it, and even then it`d almost certainly just blow the power supply, or just lie there dead (the TV that is). But if, by some incredible set of circumstances, a particular piece of equipment managed to develop a fault which could put mains voltage onto said socket (and I`ve never seen it in 15 years) I`d have thought it`d be far more likely it`d blow the fuse(s) or even blow out a PCB track. And anyway years spent delving into the depths of TVs whilst they`re switched on means I`ve had dozens of mains shocks * (though it`s advisable not to be touching anything earthed whilst this happens though ! ). What can I say ? I`m still here. But on the other hand people do get hit by asteroids, apparently. Whatever the likelihood of any problem, remember the golden rule : cover your arse. * Interesting sidelight. Most people think that getting the odd shock is a TV engineer`s biggest bugbear, whereas in actual fact the most painful part of being a TV engineer is getting accidental burns off the solder or the soldering iron ! And they can hurt for days, not just a few seconds as the average electric shock does. Further comment on regulations came from Mike Felton who, after reading our tests on interference problems running CoAx next to mains cable, took the trouble to inform us that it`s against Electrical Regulations to run 2 different categories of cable together unless separated by a fireproof barrier. We`re grateful to him for taking the time to contact us. That said, particularly if you`re not doing the job in your own home, cover your arse. Well that really is a question. Firstly not all aerials read short circuit across the input, half an hour with a meter on a load of aerials round our shop produced the results shown in the table. But why do any aerials read short ? RF isn`t a DC voltage*, it`s AC, and it`s not just AC but very high frequency AC. In fact for TV/FM/DAB we`re talking MHz (where 1 MHz equals one million Hz). When measuring the dipoles I used a standard multimeter set on Ohms, but I also tried a 100 kHz ESR [Effective Series Resistance] meter (i.e. I was checking the impedance at 100kHz) and I still got more or less the same results as I did with the multimeter at zero Hz (i.e. DC). It would have been interesting to see what results I`d have got (particularly across the baluns) using an ESR meter working at 600MHz ! On the other hand, in some circumstances only 50Hz can make a big difference in impedance. If you used a meter on Ohms to check the winding of a mains transformer it`d read dead short but to mains AC [at only 50Hz] it certainly isn`t short circuit, if it was it`d blow the fuse (or the winding). With relevance to this article one should always bear in mind that AC currents can be induced from one circuit into another (that`s how transformers work) so in actual fact you don`t always need continuity [as read by a multimeter on Ohms] between two points on a particular circuit for the signal to pass between them. If you start putting coils and resistors and capacitors in networks/circuits you then start getting some very odd results (i.e. resonant at certain frequencies), and that`s the basis of RF transmission and reception. Accessing the hidden service menu, used for switching on RF2, and/or, altering the frequency / channel of the RF2 output. Be very careful what options you change in these menus, particularly the satellite dish settings ! Note ! From Aug 2013 Sky have removed the RF2 output from their receivers (tossers….) So if you want to use the digilink facility you`ll need to buy a separate “IO Link”. If you`re short of pre installed cables you can send more than one signal through one downlead, even in different directions ! Note that the TV point next to the Sky box would not receive the signal from the aerial(s). Splitting Signals From A Satellite Dish incl : looping across to an alternative satellite point. 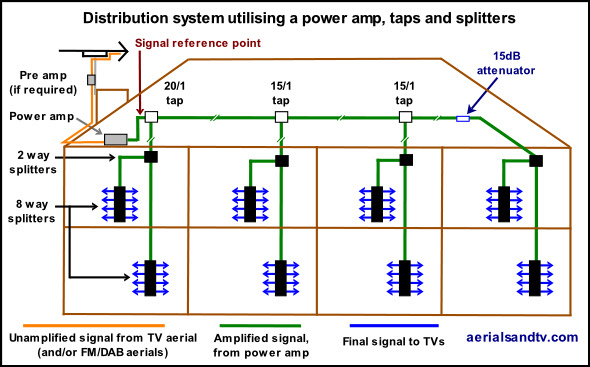 * Actually there is one TV/Sat diplexer that will enable powering of a mast head amp, but that does it by using clever electronics to detect the mast head amp then supply 12V to it by utilising the DC power from the satellite box. Thus, technically, it hasn`t got through power pass because if you removed the satellite tuner then the mast head amp would stop working, regardless of whether you had a PSU on the downlead. Using the correct UHF/UHF diplexer you can also send the RF2 signal one way and the signal from your aerial the other (though only if your transmitter is grouped). It`s like magic isn`t it ? ! ? Here we`re sending a satellite IF frequency signal down from the loft) and a UHF signal (in this case the RF2 output from a Sky box) back up the other way. An additional refinement of this is that the Digilink (IR Return) signal will still work but only if the distribution amp is mains powered (like this one) as opposed to one which is remote powered by the Sky box. The reason is that the diplexer can only have power pass* on the satellite leg if the LNB switching is to work correctly, thus the 9V sent to power the eyes (or the remote amp) can`t pass. However, the IR return signal can pass so we just need to add the voltage for the eyes from the mains powered amp. Theoretically the receiver may work at up to twice these distances but it`s not recommended. These distances would be slightly less with RG6 type cable and significantly less with the thinner 4.5mm stuff which is often used by tight aerial installers. Straight away one can see that if (to receive the desired programmes) the receivers happen to require different modes at the LNB then that is impossible, and that is why you can`t reliably split the signal from one LNB to a number of receivers. However, life is never as simple as that. 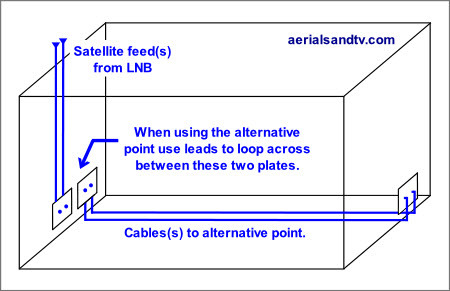 If two receivers linked to one LNB by a splitter, are, by pure chance, tuned to channels which both require the same mode (e.g. horizontal polarity high band) then both receivers may well work fine, assuming the signal is large enough to still work after losing 5 to 6dB through the splitter. Furthermore, if the LNB is split to two points but only one receiver is ever in use, then that too can work, again subject to there being enough signal to cope with the splitter loss (5 to 6dB at satellite IF frequencies). In both cases the splitter must be capable of working up to satellite frequencies (not all are) and have power pass on both outputs, the internal F conn splitters we sell fulfil both criteria. So, if one LNB can only supply one receiver, the obvious question is, how do you supply signals to multiple receivers (or even one Sky+ box, which needs two separate feeds) ? After all blocks of flats haven`t got hundreds of dishes on the side walls have they ? Not usually anyway. There are two ways round this, one LNB can have multiple outputs, two, four or eight being the commonest, though I have to say having four, or even worse, eight, cables coming out of your satellite dish and down your wall, can look pretty crap. You can make it look neater by using twin sat cable, but an eight way would still need 4 lots of twin cable....... We sell 4 way (Quad) LNBs, though you don`t have to use all four outputs if you only require two at the time you fit the system. The other way, used in most large systems in flats, is to use a Quattro LNB (which supplies all four modes of LNB operation simultaneously) linked to a multiswitch. The latter then needs a separate cable from each of its outputs to every receiver (or two to every Sky+ box), but it can then supply any of the 4 LNB modes as required by each of the receivers. These are not simple setups and the dish should be 80cm or more to increase the signal to noise ratio (though 60cm can be used if desperate and the dish is close to the multiswitch), i.e. not just a standard Sky dish, which the Quattro LNB wouldn`t fit onto anyway. We do not sell Quattro LNBs or multiswitches. The low band frequencies (into the LNB) are from 10.7 to 11.7GHz and high band frequencies are from 11.7 to 12.75Ghz. These are down converted in the LNB by the use of a local oscillator into satellite IF, ranging from 1 to 2GHz.. This is the signal which travels down the cable into the satellite receiver. Horizontal polarity is selected by the receiver supplying 18 volts to the LNB, vertical polarity by the receiver supplying 13V to the LNB. High band is switched on by a 22kHZ tone being sent to the LNB by the receiver, and low band by the absence of that tone. Thus it can be seen that if two receivers (connected to one LNB via a splitter) both want different modes from the LNB certain priorities apply. If either receiver has the 18 volts switched on (for horizontal polarity, as opposed to the 13 volts for vertical polarity) then horizontal polarity will be switched on at the LNB. Similarly with high and low band, if either receiver has the 22kHZ switched on then that is what the LNB will switch to. Some people just want an alternative point to use their satellite box or PVR. Thus they don`t actually need to split the signal at all if they use looping cables as in the diagram. Don`t use cheapo crappy unscreened wall plates though, use decent ones like these. To calculate the wavelength (in cms) divide 30,000 by the frequency (in MHz). 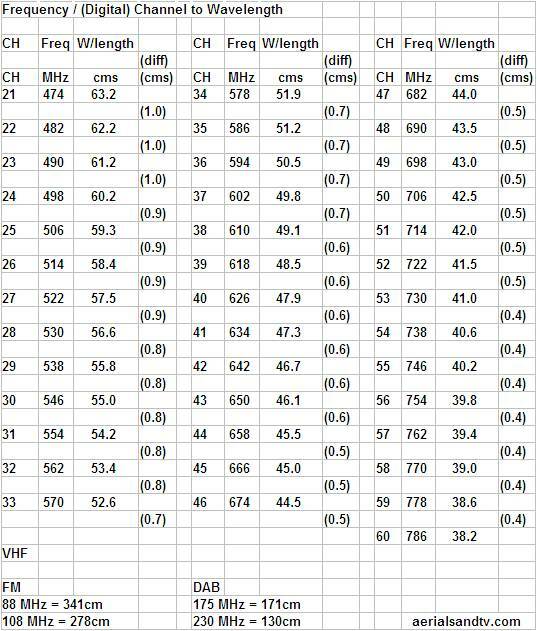 The frequencies given in the table are for (most) digital MUXES, for analogue channels deduct 3MHz (see article above the table). If cutting an FM Half Wave down to peak it on a frequency (or maximise DAB at the expense of FM) work out the wavelength, then divide by 4*, and cut each element to that length. When we experimentally peaked up an FM Half Wave for DAB : the mid point frequency would be about 200MHz, the wavelength of that is 150cm (see above), divided by 4 is about 38cm (per element). And sure enough the DAB response did improve to just behind a DAB dipole, though the FM dropped off quite a way ! Similarly, to peak up the Half Wave to (say) 104MHz (wavelength 288cm) cut each element to 72cm. How much difference that would make in reception I`d be interested to know ! * It`s a Half Wave dipole (i.e. divide by 2) and there are two elements making up the aerial (divide by 2 again). Quite a few people want to paint their satellite dishes in an understandable attempt to camouflage the ugly things. It`s also not unknown for some folks to paint their aerials. Thus we quite regularly get asked whether the paint would have any effect on reception but, to be frank, I didn`t know the answer for sure so used to give a noncommittal answer implying I didn`t think it`d make much difference. However, in October 2013 the MB21 E Mail list had a discussion on this very subject and the conclusion of the learned brethren was that painting aerials and satellite dishes wouldn`t make any significant difference at all, though it may be a good idea to use spray paint so as to give a smooth finish, particularly with satellite dishes. The modulated output (from RF2) on most Sky boxes is about 70 dBμV, which equates to a medium strength signal, and as such it can often feed two points with a passive splitter, provided the cable runs aren`t too long. Note that if the Digi Link system is required this will not usually work through a splitter, even one with power pass, see below. The “loop through” RF (from the aerial) is usually amplified slightly, about 4 dB, which is about the loss you`d get through a 2 way splitter. Thus if the output from the RF2 is fed into a 2 way splitter you`ll end up with what you had at the input to the Sky box, this obviously excludes any losses in the cable run(s). FM and DAB signals as well as TV can also be looped through the Sky digibox, as they can through Digilink amps. The 9v (and, often, the IR return path signals) from the RF2 output on the Sky box will pass through a splitter (e.g. 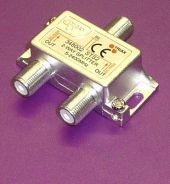 an F conn splitter) with power pass, but only from the output to the input, i.e. not in the direction required to actually use the splitter as a splitter ! However, it should be noted that certain types of 2 way CoAx splitters (e.g. the ones we sell) seem to work the Digilink system [when only splitting 2 ways]. It`s not really recommended and you will obviously only get half the signal out of each leg, but you could experiment to see if it works for you, if you`re really that desperate to save £15 odd. If you need to feed more than one point and require Digi eyes to work the correct method is to use a Digilink amp. Also see using a diplexer for Digilink. Note ! From August 2013 the boxes supplied by Sky do not have an RF2 output (don`t you just love Sky, not) so you`ll need to buy an IO Link adapter to restore the Digilink function. Furthermore not all IO Links supply the 9V for a remote powered amp (if you`ve got one of the latter). Even the ones which will do that require an external power supply, at extra cost, naturally. Personally I`d tell Sky I`d cancel my subscription if they didn`t supply the relevant adapter FOC…. 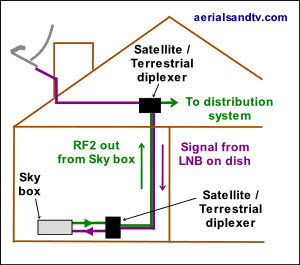 If using a diplexer to add a Sky (or CCTV) signal to another UHF/VHF signal [e.g. from your TV aerial] a diplexer (of the type we sell) will pass the Digi link / IR return path signal and its accompanying 9V, but only on the low leg, i.e. not if the Sky output is connected to the high leg. For example the received signal from Emley Moor (or Winter Hill or Sutton Coldfield etc etc) could be connected to the high leg (and the RF2 connected to the low leg) of a CH36 or CH38 diplexer without losing any of the transmitter`s output. Note that any FM/DAB signals must be routed through the low leg ! The diplexers aren`t actually specified to pass the IR return/Digilink frequency but it does work, in fact whilst experimenting to see just what you can do with diplexers we found the Digilink signal will pass quite happily through two diplexers in series (either way). Note the power pass switch on the diplexer must be set to “on”, for the the 9V from the Sky box to pass through. Why does my signal improve (or deteriorate…) at night ? I read an interesting short article (on the above mentioned MB21 E Mail list) the other day, it was about Tropospheric Propagation. Basically the weather can affect how well you receive your signal (see below), but it must be born in mind that if your problem is co-channel interference (CCI) then your picture and/or sound may actually get worse ! For tropospheric propagation the argument goes that as atmospheric turbulence (due to convection from solar warming of the earth) reduces and the earth cools it is easier to form stable air layers of reduced refractive index which help to guide the signal beyond the daytime horizon. Temperature inversion created ducts are also more easily formed and can offer much reduced path loss. Hence, fringe area reception conditions gradually improve after dark and peak a little before dawn. Higher frequencies are affected more than lower ones because the longer wavelengths require much larger atmospheric ducts, which are harder to form. UHF television is especially sensitive to these effects. Within the service area signal enhancements of 10 dB or more are common (>10% of days). Close to the coast enhancements due to duct formation as land cools are also common. Ducting can bring CCI from very distant stations and so is generally regarded by broadcasters as a problem. The DX TV * enthusiast sees it differently. If you want to read more there are loads of measurement campaigns described in BBC Research Reports, try this 1959 report or this 1989 one for example. Also see Mike Willis`s article on this subject. * DX reception = (long) distance. I would only add that a 10dB increase in signal is very significant, as an example that`s more than the difference in received signal between a large XB16 and a little DM 18 Log ! Fault finding on a digilink system. If your digieye(s) stop working the first thing you should do is take it downstairs to the Sky box and plug it straight into that, but make sure it`s fitted the correct way or it won`t work whether or not the Sky box is faulty. On the ones we sell the female CoAx on the junction should be plugged into the Sky RF2 output socket, helpfully it`s a male CoAx on the latter. Obviously, assuming the eye is OK, if the it doesn`t work there the problem is box related (possibly the output on the RF2 output has been deselected) so there probably isn`t anything wrong with the cabling and any amplifier further down the line. If the eye does work when correctly plugged into the Sky box then move it down the line (e.g. the input to any amplifier) and try again, repeat until the point at which operation ceases has been reached, that`s normally the fault area. Our eyes and remote powered amps have LEDs fitted so this makes fault finding easier, if the LED is lit (denoting presence of the DC output from the Sky box) then normally the RF signal is also present. I have to say that in all the years we`ve been selling them we`ve never had a 4 way digilink amp that`s faulty (we`ve had a few sent back “faulty” but when we tested them they were fine). This is what you`d expect because when any amplifier fails (or indeed many electronic products) it`s the power supply section which is most likely to be the culprit, and on a remote powered amp the power supply is in the Sky box ! The same basic fault finding procedure also applies to digilink systems using the I/O link since Sky helpfully (not….) deleted the RF outputs on their digiboxes from August 2013. 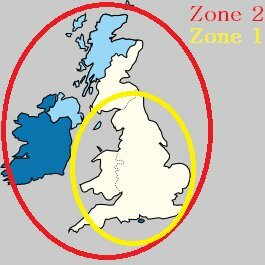 A Zone 1 dish is smaller than a Zone 2 so therefore has less wind loading. On the other hand a Zone 2 dish has about 2dB higher gain so should give you a more reliable signal, e.g. less chance of "rain fade" and can send the signal down a longer cable. Because the Zone 2 dish has a higher gain (and therefore a smaller acceptance angle) alignment of it is more critical. Obviously the great majority of people fit the Zone 1 dish, and apart from a bit of "rain fade" they generally work acceptably. Should I fit a Zone 1 or Zone 2 dish ? A Zone 1 dish is approx 43cm x 58cm. A Zone 2 dish is approx 56cm x 75cm. I`ve two cables running to my wall plate ! NOTE : having two outlets on a double wall plate that is fed from only one cable is effectively the same thing. 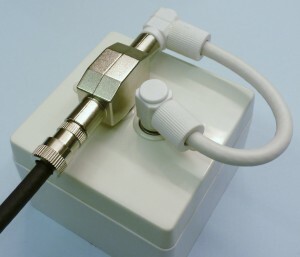 Use a single plate and plug in a CoAx splitter. If you mean you`ve got one cable coming in from one side (from the aerial) and another going off somewhere else, well your system has been bodged…. The installer has daisy chained your TV outlets or put them in series (or is it in parallel, it depends on your definitions ! ) but whatever description you want to use he`s done it wrong. That isn`t to say it won`t work, to a greater or lesser extent (bodgers are notoriously flukey), but it`s not the correct way to do it. Well for a start the plate in the picture (above right) isn`t screened, thus increasing the chances of interference affecting your signal. The other thing is that the “split” (because that`s effectively what it is) isn`t impedance matched. And here`s why it`s a bad idea. So how should it be done ? The problem is that nobody * manufactures a wall plate with a built in splitter (or tap), so one way or the other you have to fit one. If you`ve got room in the pattress box behind the plate you could try fitting a two way splitter (or one way tap) though you should try to avoid kinking the cable so that`s not an easy operation…… Standard F conn splitters and taps have the F connectors at either side but the outdoor version (the plastic case is removable) has them all on the same side which may - or may not - be useful. An alternative approach is to use a double outlet wall plate, a splitter and a jump lead as in the pictures below. This is arguably a more flexible method, but you must remember that if the splitter or jump lead is disconnected then the TV outlet further down the system won`t get any signal ! * If they do I can`t find one, they certainly aren`t stocked by any supplier we deal with. If you know of such a wall plate please get in touch with us. Why does my aerial read short circuit across the input ? I`ve got two cables running to my wall plate ! ? ! Is my aerial amplifier faulty ? Sleeving an 8ft x 1.5” pole into a 12ft scaffold pole to make an 18ft pole. Mains current on your TV tuner ? 1 Tony from Audio Visual Services (Shepshed) remembered an aerial which had been struck by lightning. The customer had actually disconnected the aerial cable because of the storm and the loose end was in the middle of the room. The lightning struck and the resulting current arced over from the end of the cable to the nearest earth, the central heating radiator. Tony says he`ll always remember her floor, it looked like a mole had travelled from the cable to the radiator wrecking the floor in the process. He also speculated that it might have been better if the aerial had been connected to the TV, it might have blown up the TVs PCB but at least it may have saved her floor ! I wonder whether the customers house actually got the main “belt” off the lightning, because if it had I`d have thought it`d have blown off part of her roof…..
Bill Wright (of Wright`s aerials) reckons to have seen quite a few lightning damaged aerials in his time, but you have to remember he`s been installing aerials since John Logie`s time* so that`d only have to be one every year or two and you end up a very big number. Actually Bill estimates he`s probably seen one lightning damaged aerial every two or three years (this excludes communal aerial systems which, he says, have a higher strike rate). Most other aerial installers, including us, report very few lightning strikes on aerials, some see one every 5 or so years but some don`t remember ever seeing a lightning damaged aerial. * Bill disputes this, he only accepts Lord Reith. Radiocarbon dating has been commissioned to prove it one way or the other. 2 I will always remember repairing a TV which had suffered from a reported lightning strike. The PCB tracks from the mains cable to the switch were all blown off and the fuse had gone. I replaced the fuse and bridged over the tracks then gingerly wound the mains input voltage up on the Variac. Incredibly it came on and ran quite happily ! 3 Roger from Electron Radio (Walsall) had an interesting anecdote about a lightning strike on a cable TV street box. The resulting surge of current took out TVs and/or VCRs in about 25 houses all along the road ! I suppose one advantage of fibre optic connection is it`d eliminate this (admittedly very slight) risk because current can`t travel up glass fibre ! Thanks to Ray Dring and Alwyn Seeds for specialist technical advice in the preparation of this article. Lightning discharges are normally in the range 20KA to 200KA. To a thunderstorm a residential area is seen as a partially elevated ground plane due to the cumulative effect of all the earthed metalwork in the structures. Lightning will take the the shortest, least resistive and least reactive path to ground. Incidentally a lightning conductors route to earth should be as straight as possible because every change of direction adds inductance. Now a house, and even more so a number of houses, have many parallel paths of low but more or less equal height, often with changes of direction and relatively high resistance. In addition they often have poor electrical earths. All of this results in higher localised voltage gradients and when combined with the small spacing between the paths to earth this means that the main lightning discharge will readily branch out to nearby conductors if it meets an increase in resistance/impedance. Also bear in mind that lightning will preferentially strike the ground if the distance between the structures is twice their height. 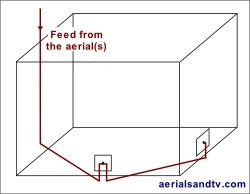 If your aerial is significantly higher than your roof (over 3m ? ) and your house is significantly above average terrain height it may be worth running an earth tape from the mast down the side of the building to an earth rod, with due regard to PME safety issues. That said, if your house is significantly above average terrain height it`s unlikely you`d need a tall aerial pole anyway (in fact your aerial may well work in the loft) so I can`t see this applying to many people ! And anyway, in the unlikely event that lightning does strike a house it usually makes a beeline for the plumbing system (which is usually copper pipe connected directly to earth) not the TV aerial. And the highest part of the plumbing system is usually the copper pipework connected to the cold water tank in the loft, and that is why houses struck by lightning typically have a big hole blown in the roof ! An alternative path to earth, much preferred by any lightning discharge to the relatively high resistance TV aerial and cable, would be any stainless flue liner up your chimney. Conclusion : The fact is that the risk of lightning striking your house really is quite remote. More to the point, if your house does actually get struck by lightning it probably won`t have been due to the TV aerial being there, and the chances are that half your roof would get blown off anyway, so under those circumstances whether your TV has been damaged really would be the least of your worries…. Fairly often we get asked about the lightning risk to your TV, and indeed the rest of your house, of having a TV aerial up on your roof or wall. It`s easy to see why people think it`s a risk, a metal structure up at height. However, although lightning tends to strike objects that are significantly above average terrain height, TV aerials are usually only a few feet above roof level so the increased risk of a lightning strikes is small. In fact I have to say, during the 15 odd years I was a TV engineer I don`t recall seeing one TV which had been struck by lightning down the aerial cable. As a bit of research I phoned half a dozen of our ex customers (we used to sell TV service manuals till Jul 2010) and asked the engineers how often they`d had lightning damage of that sort. I have to add most were approaching retirement or retired, TV repair is a dying trade (hopefully not the engineers, not quite yet anyway…. ), so between them there was a hell of a lot of knowledge, probably over 200 years in fact ! Most of them reflected my own experience and apart from the odd one they couldn`t remember ever having repaired a TV which had suffered a lightning strike down its aerial cable. Now the more observant of you will have noticed I`ve italicised the phrase down its aerial cable. This is because, although it`s vary rare for lightning to hit your aerial, it`s rather more common for equipment to get damaged by a surge up the mains (or cable connection or phone line) from a nearby strike. All the engineers I spoke to had had fairly regular (not exactly common, but it`s not unusual) repairs involving TVs and the like with damaged power supplies etc from lightning induced mains surges. If you think about it the risk of a direct lightning strike must be pretty low because lamp posts are earthed conductive structures and are nearly as tall as the average house. If they were at major risk the bleedin` things would be getting blown up every time there`s a thunderstorm, but they don`t, they seem to last for ever. Or at least until they get hit by a careering vehicle. The first question : is the indicator light (if fitted) on ? If the answer is yes it`s even less likely that the amp is faulty, this is because the power supply (the “PSU” which converts the 240V mains into the low voltage DC used by the unit) is the most unreliable part of most electronic equipment and if the light is on then the PSU is running. It really is pretty uncommon (though not unknown….) to get a faulty amplifier where its light is still working. If no indicator light is fitted try to ascertain if the unit is slightly warm or buzzing, this is an indication the PSU is running, though this is a rather less reliable diagnosis than any indicator light ! The next diagnostic step is to bypass the amp (direct to one TV) and then see if the fault is still present. NOTE : do not just turn it off because then you won`t get any signal regardless of whether amp is actually faulty. If bypassing the amp gives you a signal that you didn`t have with it in circuit (even if that signal is imperfect) that indicates the amp is faulty, though you must remember that the great majority of multi output mains amps don`t actually provide much gain so the signal shouldn`t actually be that much worse than it was before ! If your mains amp has line power and this is being used to drive a mast head amp also read the section below. As with mains amps the first question is : is the indicator light (on the power supply) on ? If it is on but has changed colour (often from green to red) this usually indicates a faulty mast head amp or a short in the cabling somewhere. If you disconnect the cable into the PSU (from the mast head amp) and the light changes back from red to green then the fault would usually be the amp or the cabling. Next, if possible, try disconnecting the cable at the mast head amp. If the light is still red but changes to green when disconnected at the PSU then that indicates the cable might be faulty. On the other hand if it remains green but changes to red when reconnected to the mast head amp that indicates a faulty amp. It must be said that it`s pretty rare for the mast head amp itself to fail because as stated above the power supply is generally the least reliable part of most electronic units. The option of bypassing the power supply (to check it) is not open to you - unless you can get to the M/H itself - because that will obviously mean the M/H amp won`t run and therefore you won`t get any signal ! If you can get to the M/H amp then try bypassing that. As an alternative (if you have a multi meter) try checking if the PSU is giving out 12V, if the PSU has screw on F connector sockets you may need to use a pin or similar to get the voltage off the centre connection. If the PSU is giving 12V out then it`s almost certainly not faulty, though we have had the odd one which would give out 12V but only off load. If you`re electronically savvy you could put a load across it (I`d suggest a 220Ω load test resistor) and check the voltage across that. Other potential problems with mast head amps are isolated wall plates which won`t pass the 12V DC sent from the PSU to the mast head amp. There are a few additional things to bear in mind when attempting to ascertain if a Digilink amp is faulty. First question : have you got the feed to the RF2 (or IO Link) switched on at the Sky box ! The next most common cause of problems with Digilink amps are isolated wall plates which will not pass the 9V DC (given out by the Sky box or IO Link) required to run any remote powered Digilink amp. They can occasionally also give problems with the IR return signal too. An additional problem was created in summer 2013 by that bunch of awkward money grabbing wazzocks (i.e. Sky) when they deleted the RF2 output from their boxes so you now have to buy the aforementioned IO Link. Not only is this extra expense and complication but most IO Links only provide sufficient current to run one Digilink “Eye” and they will not power a remote powered amp *. If that option is required you need a separate PSU which you plug into the IO Link (though some of the cheapo IO links do not have a socket for a PSU input). On the subject of remote powered amps they (certainly the one we sell) are very reliable, mainly because they have no power supply, and this, as previously stated, is generally the most unreliable part of any electronic unit. As of Jan 2015 when this article was written we`ve never had a faulty one, every single one sent back “faulty” by customers has proved to be OK and the fault was elsewhere. * The IO links we sell will run two digieyes, though they still require a PSU to run a remote powered amp if one of the latter is required. Also see ATV returns policy for amplifiers. Is my aerial’s amplifier faulty ? It`s often difficult to tell if your amplifier (“booster”) is faulty, and particularly if the amp feeds more than one TV and the signal on all of them has gone off the natural conclusion to be drawn is that the amplifier must be the guilty party. However it is not that common for amps to fail ! The “fault” is actually much more likely to be down to the aerial or the cable or the tuning or 4G etc etc. If fitting the amp for the first time, have you got too much signal ? Try bypassing the amp (or, even better, use an attenuator) to eliminate that possibility. As with any electronic equipment the best way to ensure maximum reliability for your amplifier is to let it run as cool as possible, try not to place it anywhere warm or obstruct any vents it has in its casing. The terms aren`t used so much now, but the RF spectrum used to be divided into “bands”. They were as follows, more or less anyway, the precise bands tended to vary throughout the world. 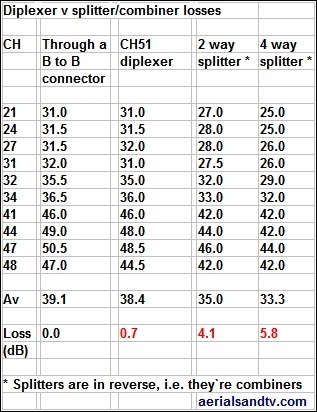 This test compares a UHF/UHF diplexer to a “splitter in reverse combiner”, but I`d expect similar results if comparing a UHF / VHF diplexer and splitter. This is not an in depth test, it`s just a bit of messing about, but, because it indicated what we know to be true anyway I`m not prepared to go any deeper ! I simply used the signals on our bench* and fed them, in turn, through a back to back connector, a CH51 diplexer, a 2 way splitter, and a 4 way splitter. The results are pretty self explanatory and are listed in the table. Some CHs show 0dB loss, I wouldn`t expect zero loss through a diplexer. The explanation is that test meter wouldn`t show up 0.5dB which is hardly anything. Any 0.5dB readings shown are the average of two. Note how the loss on the diplexer increases as its splitting frequency is approached. * I have to say they`re a bit low but I didn`t have time to find out what was causing the problem in our system, which isn`t used much these days because we no longer repair TVs ! For the purposes of this test it doesn`t matter anyway, we`re only interested in the differences. Why does my aerial read short circuit ? It is recommended that all sites in Scotland use a Zone 2 dish, though this isn`t a cut and dried issue. As you go further north the satellites footprint will mean the signal will diminish, so I wouldn`t have thought there`d be much difference between northern England and southern Scotland. 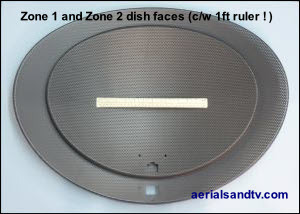 A Zone 1 dish may well work OK in Scotland but be more susceptible to “rain fade”. The frequencies used (i.e. into the set top box) by cable TV companies are generally in the range 5MHz up to 860MHz, or, sometimes, 45MHz to 860MHz. That is to say VHF and UHF. The signal can be split to feed more than one set top box by using a splitter capable of handling that frequency range, our F conn splitters will work for that. You will obviously suffer a 3 dB attenuation through the splitter and, in fact, when the cable company add a splitter to your system they would usually turn up the power slightly to compensate for this loss. I`m not an expert on cable boxes but the vast majority of tuners in TVs would normally cope pretty well with a fall off in signal of 3dB, assuming the original signal was of decent amplitude, obviously. If necessary, having tried the splitter on its own first, you could try adding a variable gain amp in front of the splitter. The 1 & 3 way mains amps we sell goes down to 47MHz but this may well work down to 5MHz, and, in fact, some say that non return path amps are more likely to work below their specified 47MHz than return path amps and our preferred model of mains amp is a non return path model. Remember that not all cable systems use the 5 to 45MHz band anyway. Cable Boxes : altering the channel of the RF output. This method works for many cable boxes, including models by Telewest, NTL and Virgin Media. Unplug the Box > Wait 20 seconds or so > Hold down the “Up” and “Down” select buttons > Whilst holding buttons down plug box back in and wait 10 to 20 seconds > Box will boot up in Engineer or DIAG mode > Use OSDs to reset RF channel. then plugging it back in again works ! Note that some of the V+ boxes* do not have an RF output, or even an RF input come to that, which, I have to say, is very poor design. If you`re ordering a V+ box I`d ask whether you can have one with a modulated RF output, certainly if you ever want to set it up like a Sky system and watch what is on it in any other part of the house. If they supply you with one that has no RF output, you then need to buy a modulator. So I`d complain to Virgin that their crap design has meant you`ve had to shell out, and mess about generally, so you`d like them to pay for said RF modulator. Personally speaking, I think you`d have a case. Incidentally, apparently there`s some rumour out there that the Virgin V+ box doesn`t give out a signal from the SCART socket when the HDMI is in use. Well one of our customers said he set up one of our modulators off said SCART and it worked fine regardless of whether HDMI was selected or the programme was in HD (though obviously the signal from the SCART and modulator would only be in standard definition). * Virgin`s version of Sky+ (or Freeview+), i.e. can record and also pause live TV etc. Note that use of long lash wires and (particularly) lash wires joined together reduces the chances of the lash tightening up before all the threads on the O & J bolts are used up. So, make sure you pull the wire as tight as possible (and the O & J bolt nuts are at the end of their threads at the start) before completing the lash loop round the final J bolt. 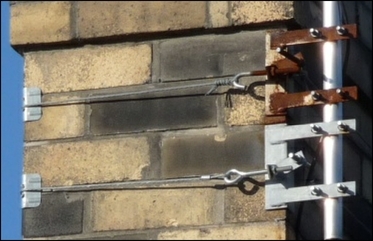 This method can give you an aerial mast with a height of about 18ft using a 12ft scaffold pole and an 8ft x 1½" pole. The weight and strength are low down. This is far stronger and more stable than a 2” aerial mast of the same length (it`s also lighter and cheaper than a 20ft scaffold pole and avoids the “direct from the supplier” extra carriage charge ! ). There isn’t much clearance between the inside diameter of the scaffold tube and the outside diameter of the aerial mast. The small gap must be tightly filled however or the installation will rattle. After a lot of experimentation we found a simple solution: a few turns of good quality PVC insulating tape. 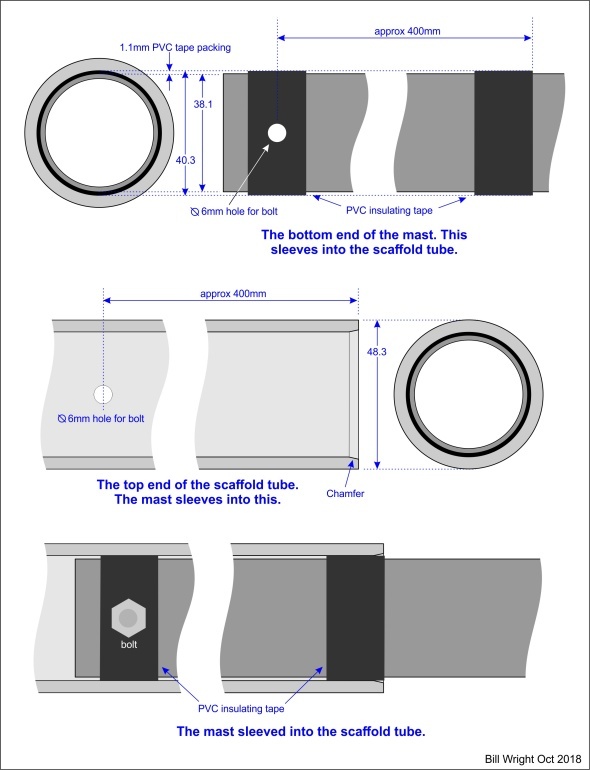 The tape should be in two locations: right at the top of the scaffold tube (corresponds to about 400mm from the bottom of the aerial mast) and right at the bottom of the top section of 8ft x 1½" pole (corresponds to about 400mm from the top of the scaffold tube. Wrap the tape around the aerial mast, making a slightly tapered shape that will slide into the scaffold tube. Keep adding one turn at a time until the tape at the bottom end of the aerial mast is a snug fit. 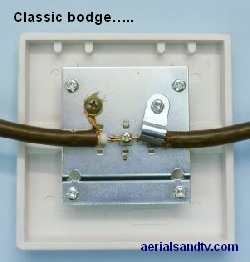 For the tape at the top end of the aerial mast do the same but go slightly beyond a snug fit. Cut a slight chamfer on the inside surface of the scaffold tube to lead the tape in, this can be cut easily with a sharp knife. Insert the aerial mast into the scaffold tube (you can use cable pulling fluid to lubricate if you like) and ram it home so the top tape is really tight and compressed. Ram the assembly against a wall or tree or whatever. The two tubes should now be firmly locked together. Drill a 6mm hole through both poles at the point where the lower tape is. Insert a 6mm bolt or machine screw, tighten and apply Loctite or use a Nyloc nut. Don’t overtighten, the bolt will snap before the tube deforms. Don’t drill through where the mast goes into the scaffold tube because that would weaken the main stress point. I like to wrap self-amalgamating tape over the top edge of the scaffold tube running it onto the aerial mast, just in case frost gets in. If you would like a professional installer for this sort of job and are in the Sth Yorks / Nth Midlands area try Don Valley Aerials (07930 347632).